After reading Wednesday is Spaghetti Day by Maryann Cocca-Leffler Mrs. McGe,e’s third graders wrote, illustrated, and recorded digital books. They used the app Book Creator. This app allowed them to add text, pictures, and audio to their books. They really did a very nice job! We have found that using “offices” when recording helps minimize background noise. It’s like a mini sound booth. As students in Mrs. Grave’s Science class studied force and motion, they created Kicking Machines to move a ping pong ball into a cup 12 inches away. They started with the idea from the Design Squad but added a technology twist. Once students created their machines, they used an app called VideoPix to film their Kicking Machine in action. This app allowed students to slow down their videos. Then, they were able to capture images from the video showing the machine and ball in action. Using these pictures, they created a Pic Collage showing potential and kinetic energy. Finally, using an Aurasma app, the slow motion videos were imposed on the Pic Collage. Now, when someone scans the Pic Collage with the Aurasma app, a video will pop up and play. It’s hard to explain without seeing the posters in action, but here are a few examples. 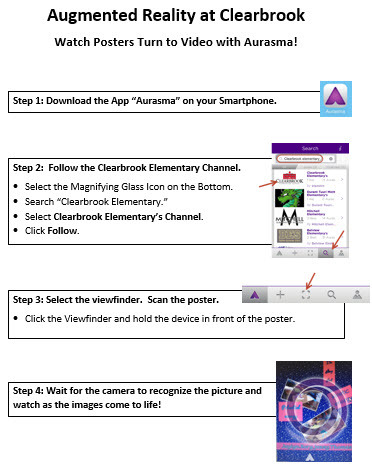 If you follow the Clearbrook channel on the Aurasma app, you can scan and see their videos. Students in 2nd and 4th Grade at Clearbrook and 2nd Grade at Oak Grove joined 15 million students around the world as they learned an Hour of Code last week. They explored the basic concepts of Computer Science with drag and drop programming using a game-like tutorial starting Angry Birds and Plants vs. Zombies. They also briefly explored MakeyMakey and Little Bits. There are some activities that I know students will enjoy, but then I still get blown away by their excitement. This activity was one of those things. The kids were beyond excited. I was amazed by their problem solving skills, how they helped one another, and some of the solutions they came up with. I’m pretty sure some went home and coded some more. Here are some pictures from both schools. Students in Mrs. Schlosser’s class used QR codes, iPads, and videos to explore Jamestown! It was an adaptation of the geocaching activity I did with students last year. This time, instead of finding boxes in the school yard with questions in them (it was way too cold), students scanned QR codes placed in the halls of the school. The QR codes asked questions, and students used videos loaded on the iPads from HistoryIsFun.org to answer them. We did learn it was important to spread the QR codes far enough a part so that student groups didn’t feel crowded by other groups. They all had fun and learned about Jamestown too!